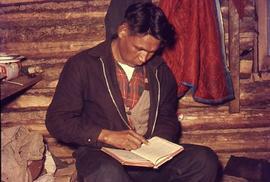 A man reading a book in a log home in Pauingassi, Manitoba. A young family sitting on a couch. 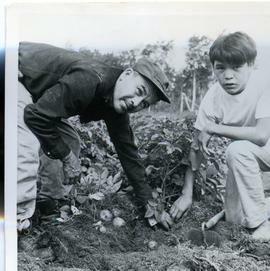 Mennonite Pioneer Mission worker Abe Hoeppner (left) with an arm around a friend. Location is likely Bloodvein, Manitoba, where Abe served with MPM. 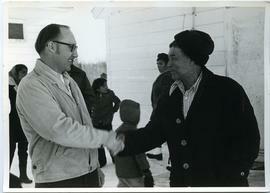 Abe Hoeppner (left) and Alfred Cook shake hands outside after a church service (?). 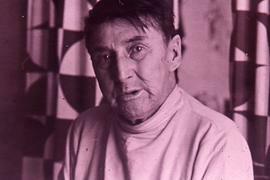 A candid of Adam Hardesty, from Hollow Water, Manitoba. 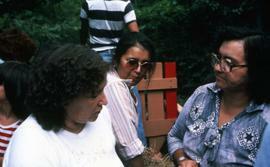 A picture of Indigenous adults who attended Native Camp as children. They are now volunteering at camp. 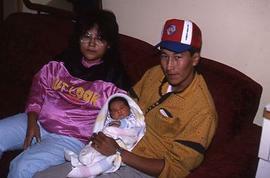 A photo of Alex Simard and his son in Manigotagan. They are pulling potatoes from the garden. 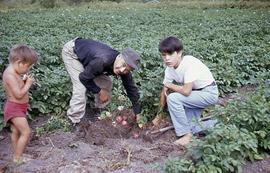 Alex Simard and his children are digging up potatoes from a field in Manigotagan, Manitoba. 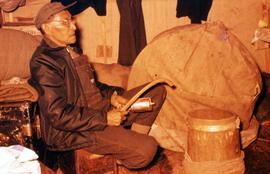 Alex Owen sitting at a drum in Pauingassi, Manitoba. 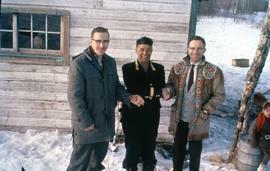 Alfred Cook of Bloodvein, Manitoba shakes hands with two men. 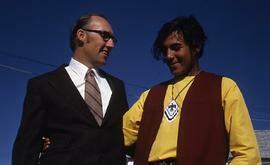 The man on the right wearing a jacket with indigenous decorations on it is Mennonite Pioneer Mission missionary Edwin Brandt.